As you all probably know, considering the 2 year lead-up to today and the considerable press coverage, it's Bill Gates' last day at Microsoft. I'd like to take a slightly different spin on covering his career and life, by pointing out the stupid stuff, in the hope it will appeal to my target audience: the student. He's been shot by a US Army officer, he had been assassinated for a short while until they realised he hadn't, he had his credit card details stolen by a 19 year old hacker, he's posed provocatively for the cameras, awarded a useless knighthood by the Queen, he has been immortalised as a Simpsons character, been sued an awful lot by an awful lot of people, also probably got into quite a bit of trouble with his wife, and let's not forget the time when he was just a wee little lad, he got himself arrested. 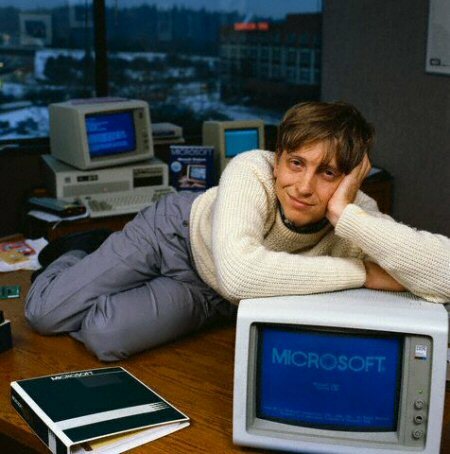 The one thing I remember was being 9 years old, with my Amstrad CPC-464 upstairs in one room and a Windows 95 machine in the other, seeing Bill Gates on the BBC six-o'clock news getting smashed in the face with a cream pie. I can honestly say, hand on heart, I actually wet myself when I saw that. Just for your sake, you can see the pie-smashing here and the humiliating walk of shame afterwards. He was on his way to give a speech about education in Brussels, when a student named "L'entarteur" or "The Pieman" appeared from behind a pillar, planting a rather tasty looking cream pie in his face. Noel "Pieman" Godin gave an interview after it happened, claiming, "the attack against Bill Gates is symbolic, it's against hierarchical power itself", according to the website Bitstorm. Some years later, and some years ago, Valleywag decided to publish an article on Bill. Being the Silicon Valley gossip rag that they claim to be, there's often some satire involved. With their deceptive eyes, they noticed subliminal anti-competitor threats as he was speaking to Tim "O RLY" O'Reilly, by purporting that he was imagining Google, Apple and Facebook and punching the air as if they were there in front of him.Bill Gates and/or Microsoft have been sued more times than I care to count, ranging from his own Government, all the way to the European Commission, and surely some in between as well. During the summer of 1998, he was giving his deposition in the US vs. Microsoft case, and as you can see by the following grouped images, how the CEO at the time, behaved in an official court session. "Immaturely" comes to mind first off, although it seems by late afternoon that day (the bottom right hand image) he'd cheered up quite considerably. Moving on, and I'd advise kids reading to skip this next bit, because it's going to give me nightmares - who knows what'll happen to your undeveloped minds. Masajeando: adv. adverbial present participle of masajear. Masajear: conj. to rub or massage. You got that? After my research, I was doing some senseless Googling and came across this, what appears to be Japanese or at least of Oriental variety, of Bill Gates masajear-ing Steve Jobs. For the sake of your precious eyes, I haven't uploaded it. Should you wish to force yourself into months of therapy, you can see the picture here. You couldn't resist could you? It's awful, I know. On his friends list is current CEO Steve Ballmer, the evil queen prince of numbers Steven Sinofsky, Charlie Kindel and many other high-up staff; it seems he may not be as popular as thought though, with little over 100 friends to his virtual name... rather sad really. Last but not least, is something Melinda should be somewhat worried about... although in hindsight, probably not - he was most likely consumed at the time with worry at the failing mistakes of Vista. There seems to be no actual story out there as to why he was taken in a photo with Warren Buffet (yawn) and at least 10 other Hooters' staff, but the pictorial evidence remains. So, Bill Gates leaves Microsoft after three decades to save the world from Bob Geldof poverty, disease and general all-round badness, and you know what? Bloody good for him. He's given us an awful lot whether we like him or not, and whether we like Microsoft or not, he's created a huge empire with some fantastic products, and as we've just seen in this article, he's made us laugh a few times, whether he intended to or otherwise. I shall miss him... for a short while, then get over it, but Microsoft probably won't ever be the same again.